Posted byEric Mesa	 7 Feb 2014 3 Feb 2014 1 Comment on Holy MOLY 9 YEARS! Nine years ago today I started blogging using WordPress. I’d been blogging for a little bit before that on Tripod (and I’ve been copying those posts over to this blog, so that post might not appear to be the first one. 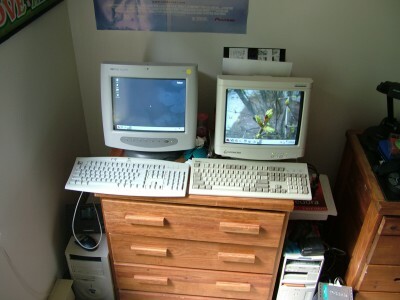 Those are the posts that start with [1.0]) , but this was when I took blogging into my own hands. I just can’t believe it’s been that long – it certainly doesn’t feel like I’ve been blogging for that long. The blog has moved from a server running Fedora Core 1 in my apartment in college to a server running BSD in my first apartment after marriage to being hosted on ServInt. I know not everyone has the money or the technical know-how to run their own computing resources, but perhaps it’s a reason for people to start learning again instead of considering their computers to be black boxes that bring them tweets, Facebook, and the rest of the net. By my second post, I was already singing the praises of WordPress and by my third post I was already writing poetry on here. (Something I haven’t done in a very long time) It’s actually kind of sad that the poem is still relevant today – in fact more than it was back then. The problems haven’t gone away. It’s fun to take a look back and see how much the interface has changed. I remember nearly all of those. I’ve gone back and forth on various subjects – I no longer post nearly as much on FLOSS software as I used to. Politics went from a strong focus to the background and made a resurgence in early 2013. Of course, I was years away from being able to write about fatherhood back then. I’ve also varied in how personal the blog has been. Overall, it’s been an amazing journey for me. I’ve been able to write and sort out my thoughts and feelings and I’ve been able to write posts that have helped others with technical issues. Assuming all this stuff – blogging, WordPress, etc still exists in another nine years – it’ll be interesting to see how my writing has once again evolved. 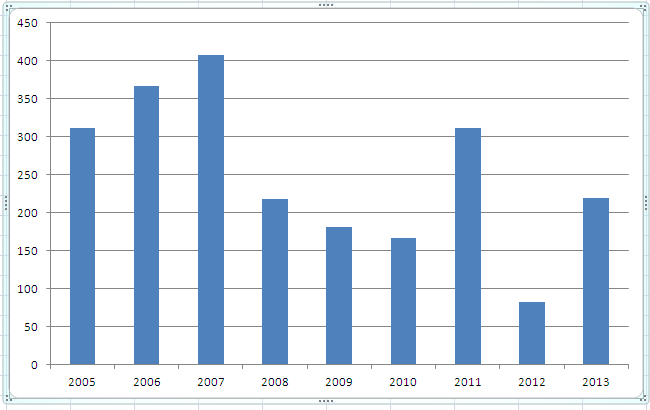 Here are some graphs enumerating the posts I’ve made monthly and yearly. 2014 will show whether the upward trend is continuing or was just another blip like 2011. I started 2013 with lots of posts, but then it petered off because of life.